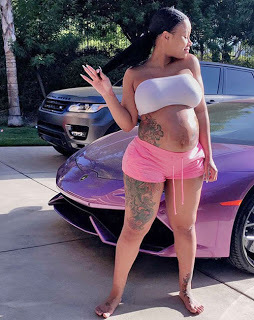 This report is according to Media TakeOut, they are reporting that Blac Chyna went into early labour after watching the presidential election results. "Chyna and Rob are preparing to have their baby today inside a Los Angeles hospital. MediaTakeOut.com confirmed that members of the ROB AND CHYNA reality show production team were called into ACTION late yesterday. According to our snitch in production, Chyna went into “pre-labor” and was taken to the hospital. Luckily everything looks fine – it just seems like Chyna’s baby, which is due next week, is coming a bit early. So what CAUSED the baby to come early? MediaTakeOut.com learned that Chyna was “under stress” because of last night’s election of Donald Trump as president. We’re told that Chyna and her mom and the ENTIRE CAMERA CREW are with Chyna in the hospital. The baby can come at any moment.